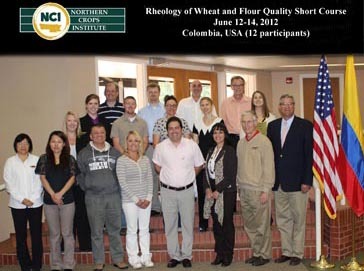 Twelve participants from Colombia and USA are attending the Rheology of Wheat and Flour Quality Short Course at Northern Crops Institute (NCI). The course, which runs from June 12-14, focuses on measuring wheat and flour quality and how to analyze, interpret, and apply rheological results effectively. Lectures touched on all aspects of quality analysis from kernel quality, milling, rheology analysis, and baking evaluation. An important aspect of this course is learning how to evaluate wheat and flour quality using rheological instruments. Equipment demonstrations included: Buhler lab mill, Alveograph, Mixolab, RVA, Amylograph, Farnograph, Extensograph, TA-XT Plus, and C-Cell Technology.